About Graham Smith: Graham Smith is married with a young son. A time served joiner he has built bridges, houses, dug drains and slated roofs to make ends meet. For the last fourteen years he has been manager of a busy hotel and wedding venue near Gretna Green, Scotland. An avid fan of crime fiction since being given one of Enid Blyton’s Famous Five books at the age of eight, he has also been a regular reviewer and interviewer for the well-respected website Crimesquad.com for over six years. Noelle: As an author, what has been the worst or most unhelpful criticism you have had about your books/short stories? Graham: I have been lucky enough to avoid any truly hurtful criticism although I am always expecting it to happen. I’m always waiting for the rejection slip or review where it’s suggest I have all my fingers cut off so I can never write again. On the flip side, before I interviewed him, I discussed reviews with Harlan Coben and he told me, “You’re not a writer until you’ve had a bad review.” Therefore when the inevitable one star review arrives I plan to treat it as a rite of passage. Graham: No one has recognised themselves as yet, but I drew certain qualities from my father and grandfather while giving him my own short-tempered and impatient nature. There are also elements of Gene Hunt, Gregory House and Roberta Steel floating about in his DNA. Noelle: Crime fiction is clearly a genre you are good at and comfortable writing –if you could write any other genre, what would it be and why? Graham: First of all, thank you for the compliment. That’s a tough question to answer as I’ve read little of anything except crime and thrillers since being made to read the classics at school. I guess I would try and write an action – adventure story in the style of Wilbur Smith’s Courtney series as they are wonderful stories. Noelle: What can you tell us about your current writing project and when will it be available? Graham: I’m actually between projects at the moment. I have submitted the next Harry Evans novel – I know Your Secret – to my publisher and have the first draft of a novella featuring him completed. I hope they’ll both be accepted and released in 2016. I have also completed the first book in a second series which I’ve submitted to one of the UK’s leading literary agents. My next project is to write the second novel featuring Jake Boulder and it will see him facing off against a twisted bunch of white supremacists. Noelle: What upcoming events will you be participating in? Graham: I’m appearing at Carlisle Crime Weekend in June. I’m on a panel on the Friday talking about Cumbria as a setting, I’ll be chairing Mike Craven as he launches his novel Born in a Burial Gown on the Saturday morning and on the Sunday I’ll be chairing the Tartan Noir panel. Noelle: Snatched from Home features parents who turn to crime to save their children. Is there ever a time when you would feel that the means justifies the end? Graham: I think this question is an extension of the novel’s tagline “What would you do to save your children?” As a parent my instinctive answer would be anything or whatever it takes. I cannot and wouldn’t ever condone crime as a solution, but Victoria and Nicholas are forced to choose between saving their kids and breaking the law. While they do break the law, they do so in a way which doesn’t cause too much trauma for their victims. There’s always the possibility insurance companies would suffer the biggest loss from their crimes therefore it doesn’t seem such a nasty crime. Without giving any spoilers, it’s not as if they are mugging little old ladies. So in a roundabout way, YES, I do believe the end justifies the means in this instance. I’d do what they did in a heartbeat if my family was threatened. Noelle: You have a series of short stories–can you tell me more about them and if you had to recommend one “must read” which would you choose? Graham: That’s a great question despite being virtually impossible to answer as it’s like asking me which of my fingers I prefer. 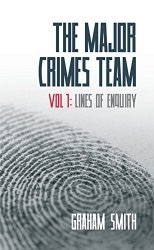 I feel that each of the five stories in Major Crimes Team Vol 1: Lines of Enquiry stands alone and has its own merits. If you put a gun to my head, I would have to say Manhunters as it shows the fervent dislike the public has for a certain type of criminal while also displaying the dangers of mob mentality and social media witch-hunts. Noelle: Lines of Enquiry introduces us to The Major Crimes Team. DI Campbell is then introduced in the chapter “Final Days”. Will Campbell be a major feature in upcoming MCT books? 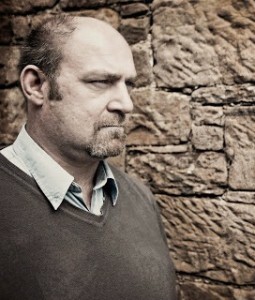 Graham: Campbell features in I Know Your Secret and also the novella – Matching the Evidence. He will always be in the Harry Evans stories as he is the check and balance I use to contrast Evans’s maverick ways. I am though considering a plot for the third book which will see him take a less central role as another member of the team is put under threat I want to tell their story from their perspective. 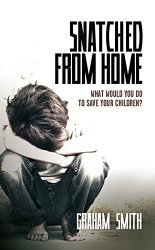 Noelle: I was pleased to see that Snatched from Home has been adapted into a play! How much input did you have in this and do you feel anything has been lost in the adaptation? Graham: I’ve been very lucky to be involved throughout the adaptation. I’ve worked on the script with the director, advised at the auditions and attended read-through. The whole experience of seeing actors performing my work has been utterly surreal and I can’t wait to see the finished production. Noelle: How far would DI Harry Evans go to solve a crime? Graham: He’d go as far as he needed to, although knowing him he’d get there via a pub or two. If someone’s life was at risk then he’d do whatever it took to save them. The situation has never come up yet, but I can imagine him using torture if necessary. Noelle: What is the worst thing a reviewer can do to get your attention or the attention of other authors? Noelle: As a reviewer yourself, having interviewed such authors as Lee Child, Jeffrey Deaver & Matt Hilton to name a few, what is the best advice you could give the rest of us reviewers / interviewers trying to get our name out there? Graham: There’s so much advice I could give but every point returns to the same central theme. Get yourself known by professionally representing a well-known site or creating one. Once you’ve got that base network your way forward with smaller name authors until the publishing houses become aware of you. Once you’ve earned their recognition, doors will open automatically. You can also get your name known by being an arse but you’ll experience a lot of doors slamming into your face. Noelle: What is something your readers may not know about you? Graham: Every time I’m asked this question I try to find another new answer. I still have a scar on the back of my right hand which I got from a motorcycle brake lever at the age of eight. Noelle: And the last obvious question, what Mr Smith, are you currently reading at the moment? Graham: I’m currently reading My Kind of Justice by Col Bury. What I’ve read so far has engrossed me with its strong sense of place and snappy dialogue.